Having just seen Solo: A Star Wars Story, we're going to go out on a limb here and say that we all really enjoyed it. Nay-sayers be damned. One element of the movie that we thought was really cool was the younger, far cleaner Millennium Falcon under the ownership of Lando. Hence our joy at getting to built it in LEGO. 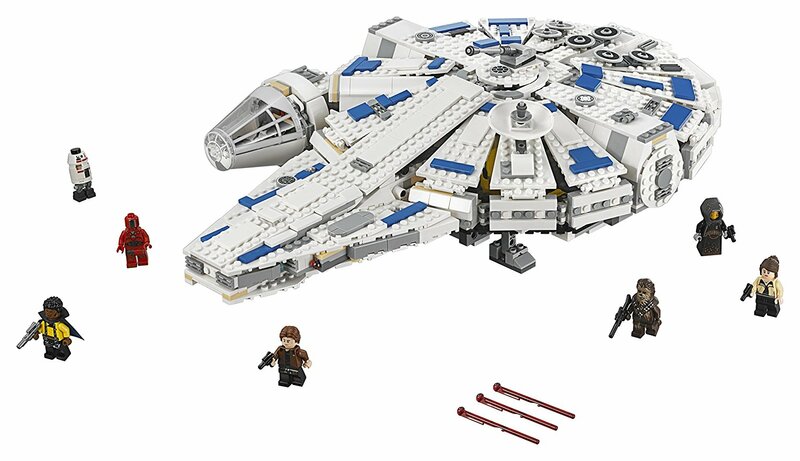 We check out the LEGO Star Wars Kessel Run Millennium Falcon (#75212). This is not a small set. This latest version of the Falcon weighs in at 1414 parts, making it slightly larger than the ship released from the Force Awakens in 2015. There are also seven minifigures included and lots of fun play and design features. Altogether, it took us about six hours to assemble, leisurely spread over a couple nights of building. The box recommends an age group of 9-14, and we think that's fairly spot on. The human characters are Qi'ra, Lando Calrissian, and Han Solo himself. We love that Landon figure, complete with cape, while both Han and Qi'ra are also finely detailed with neat printing. All three get alternate faces. The aliens are made up of Quay Tolsite and Chewbacca. Quay is a curious figure with a solid, dress-like lower half and unique headpiece, while Chewie gets a new mould in this set with good printing. And a bloody massive gun (not a Bowcaster yet). Finally, these two droids are DD-BD and a Kessel Operations Droid. DD-DB is a built figure, using an interesting upside-down technique, while the Kessel droid looks like a special type of protocol droid, ala C-3PO. Both are nice and would make great additions to a droid minifigure collection. And here she is, the Falcon herself. The finished model is surprisingly sturdy and it is very possible to pick it up and swish it around, pew-pewing. Mind you, it weighs a good couple of KG, so younger kids might struggle (and you really wouldn't want them to drop it immediately after spending hours building it!). The level of detail is impressive, and texture, from both necessary parts and additional greebling, adds up to create an authentic, realistic look. Like previous Falcon sets the exterior is made up of segments which clip together in a chain. This is the only repetitive part of the building process, but it is at least quick. The iconic blue glow of the engines is represented here by a flexible trans blue pipe which bends part-way around the rear section. ...slides right off to reveal seating for two and, weirdly, a coffee machine in the back. Granted, it's what we would have in the cockpit if we owned the Falcon. We just can't remember seeing it in the film. ...the comms dish which here is set on a double ball joint, allowing it to rotate around. In the film it seems to spend most of the time sitting flat, which is different. Open the top-side hatch and you can pull this thing free: the gun controls. Two figures can sit in it, facing away from each other, and operate the swivel laser cannons on both top and bottom. It's a nice feature and the thing slides in and out very easily. And of course there is the reason for that extended nose section: Lando's escape pod. It slides along rails set between the two protruding sections of the ship and is a play set in it's own right. Despite never seeing inside the pod in the film, here LEGO have decked it out to fit a figure, complete with an engine unit and small control panel. With the escape pod detached you can see the more familiar, and traditional, shape of the Falcon has been there all along. While we're still hanging around the front section, there are also two spring-loaded shooters. The mechanism to shoot the bolts is very well concealed, and you can't actually see that there is a play function there at all. As with previous Falcon sets, the LEGO Star Wars Kessel Run Millennium Falcon opens up like a flower to reveal the internal detail. First up, there is the engine room in the rear, complete with hyperdrive engine and crates containing macro-binoculars and some of that blue crsytal stuff they were pinching in the movie. ...a bed! How cool is that? Moving forwards is that iconic seating space with the holographic chess board and large control panel by a swivelling chair. Just be sure to always let the Wookie win. The final quarter of the interior is basically lost to the structure that makes up the cockpit access tunnel, but there is still room to stand the odd figure around. Note also spare laser bolt storage in the corridor behind where the escape pod attaches. Despite the overall lack of internal space, it is possible to line up a few nice scenes - especially if you carefully un-clip those side structures that hold on the opening roof segments. "So, you and Han... Are you guys, like, a thing?" Even setting up scenes outside looks quite authentic thanks to all that detail and the overall scale. You can even, kinda, recreate the poster image of Han and Chewie getting their first look at the Falcon. "She'll do nicely". A couple of negatives: firstly, there are a lot of gaps in the design of the roof, where the individual segments don't close together very well. From a distance you really can't tell, but close up you can see right trough the model, destroying the realism. Also, LEGO have clearly not designed this to be suspended from a ceiling or viewed from the underside, as it's bloody awful. The only underneath detail is the laser canon, and even that is bare minimum. We do understand that covering all this would have added a good few parts to the set, therefore upping the price, but still. But those two small issues are easy to forgive when you step back and look at it. 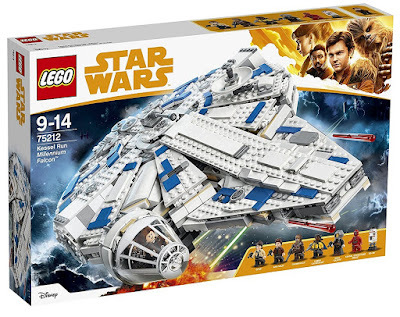 The LEGO Star Wars Kessel Run Millennium Falcon is very good, and we think it would be a superb addition to your LEGO posing shelf.